To state that Rajasthan Royals have been poor this IPL would be an understatement. They have lost six of their eight matches and everything from the batting order to their best XI has been under debate. Two Englishmen, though, have virtually picked themselves in the starting XI every single time - Jos Buttler and Jofra Archer. Archer has single-handedly lent stability to an otherwise below-par fast bowling unit this season. Before Tuesday's game against Kings XI Punjab, Rajasthan's seamers had picked up only 21 wickets in the entire season in seven matches, the worst after Royal Challengers Bangalore and Kolkata Knight Riders. Their economy of 9.27 was also the third worst after Kings XI Punjab and Kolkata Knight Riders. At Mohali, though, Archer was determined to turn those numbers around. He inspired his fellow seamers and produced a sensational performance that saw him take 3/15 in his quota of overs. Archer sent back the dangerous looking Chris Gayle first up and then added the wickets of Nicholas Pooran and Mandeep Singh in the death overs to derail Punjab's innings. He had David Miller bowled too, but had overstepped. While Jaydev Unadkat and Dhawal Kulkarni went at 12 and 9.2 runs per over, Archer conceded runs at just 3.80 while taking three crucial wickets. Kulkarni and Unadkat have been among the worst seamers in the IPL this season with poor averages and economies. Archer, on the contrary, has stood out with his numbers in a mediocre line-up. He has conceded less than 5 runs per over in five of the eight matches Rajasthan have played this season. His 10 wickets in the year have come at an economy of 6.77 and an average of 21.0. Shreyas Gopal is the only other Rajasthan bowler to take more than 6 wickets this season. 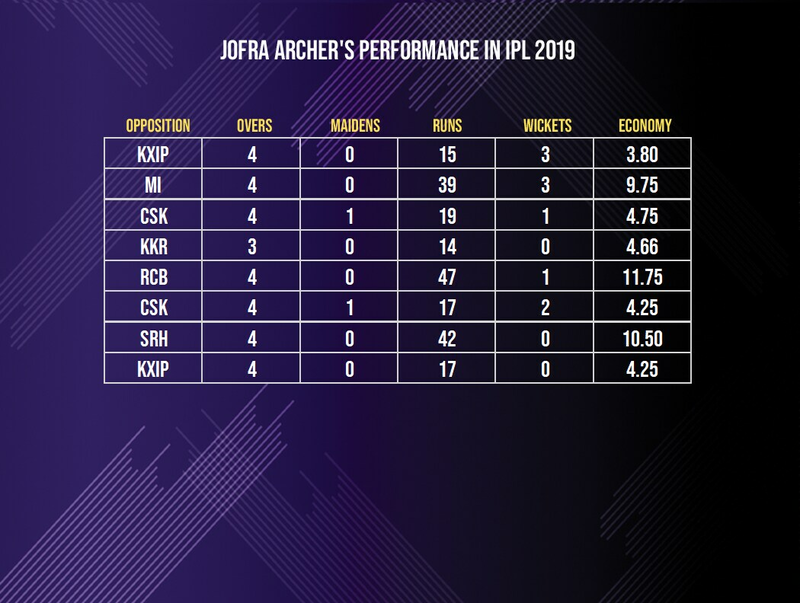 Archer, who first played in the IPL last year, had picked up 15 wickets in 10 matches at 21.66 and an economy of 8.36. This year, so far, he has bettered those numbers. The economy is way lower at 6.77 and he already has 10 wickets in the season. Slowly, but steadily, Archer's numbers across T20 leagues are showing why he is a great pick in this format in any conditions. He has played in the Big Bash League, Bangladesh Premier League, Vitality Blast and Pakistan Super League aside from the IPL and has over 10 wickets in four of those five leagues except the PSL where he has played just two matches. His economy rates and wicket taking abilities make him a threat across phases in a T20 innings. A searing yorker and subtle pace variations are added weapons in his repertoire and with yet another good season in the IPL, he is sending a timely reminder to the England national selectors ahead of the World Cup squad announcement.